Thousands of foreign (Muslim) fighters in Syria and Iraq have left their comfortable lives in the West to take up arms with the Islamic State (ISIS) savages. 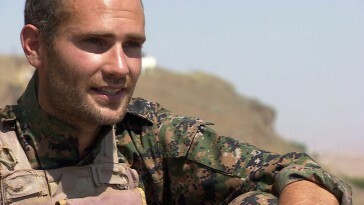 But a few (non-Muslim) western foreigners have gone to Syria, too, but they are fighting alongside Kurdish forces, battling against the jihadist group in northern Syria. BBC As they start to return home they run the risk of being prosecuted in their home countries. Britons are warned against traveling to Iraq and Syria, and certainly warned against joining the conflict, whichever side they choose. Harry was a former currency trader, with no military experience. Tall and slim, his curly-haired head would stick out a mile in north-eastern Syria. And what ISIS would have done to get their hands on 28-year-old, terribly well-mannered Harry. Having beheaded most of their Western hostages, ISIS would have viewed Harry as a trophy whom they might have burned alive in a cage or beheaded for the whole world to see. They have a saying in England, " political correctness gone mad"
Like as if it was ever sane. Its well and truly of the scale, the brit government need firing along with all the other invader hosting countries.